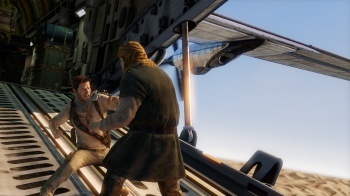 A game tester at Naughty Dog has guided Nathan Drake through countless enemies, a couple of continents, and at least one plane crash in only 188 minutes. Uncharted 3 director Justin Richmond recently broke the news to Official PlayStation Magazine that one of his staffers (who, like a true ninja, has gone unnamed) took down the product of years of top-notch game development in less time than it would take to watch The Fellowship of the Ring. Reportedly, the speed run was completed on the game's easiest setting, and the tester was already more than familiar with the game and its puzzles, but you've still got to give John Doe some credit. Three hours. Nicely done. This is the second lightning speed run announcement regarding one of the (too?) many amazing titles coming out in Q4 of this year. Earlier this month, a QA tester at Bethesda clocked an impressive two hour and sixteen minute run of Skyrim during an internal competition. As it's obvious that neither of these titles were designed for people to complete them in even close to these times, it just goes to show you how often testers must playing these games over and over, front-to-back. It's hard to say what the final length of the campaign will be (what with the exploration, treasure hunting, quippy one-liners, and what not) but it's probably a safe bet that it will take the rest of us a hell of a lot longer to get Drake neck deep in trouble and pull him back out again than three hours. We'll all have our chance to either try and beat Naughty Dog's tester, or just, you know, enjoy the game soon enough, though. Uncharted 3 hits stores on November 1st.